Not Golden Acorn Casino! We’re located right off the I-8 interstate at the Crestwood Road exit, about halfway between San Diego and El Centro. That means if you live in those cities or anywhere in between—including El Cajon, Alpine, Pine Valley, Campo, Jacumba Hot Springs, Ocotillo, and Plaster City—we’re just a quick drive away. 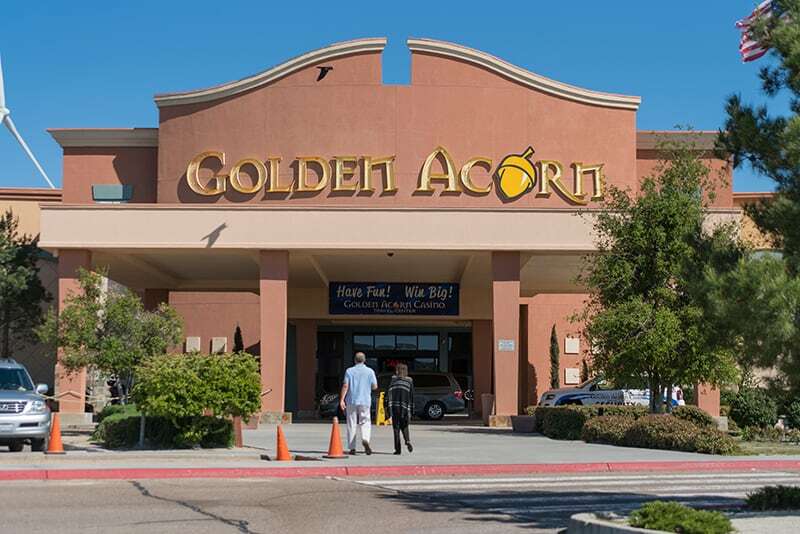 Whether you’re partaking in a fun night out or you need a break from the weariness of the road, Golden Acorn Casino can help perk you up with hundreds of slots and plenty of table games to test your luck. Our slot machines are state-of-the-art, some even featuring 3D graphics, and easy to learn. And if you’ve never tried your hand at Blackjack or Texas Hold ‘Em, our friendly dealers can give you an overview of the game and a few tips to boost your odds. No matter what game you choose, be sure to join our Player’s Gold Club to earn special offers and credits with every dollar you play. Complete your night out or enhance your pit-stop with a mouth-watering meal at our Golden Grill, which serves up everything from our famous prime rib to burgers, entrees, salads, and much more. For a quicker bite, our Del Oro Deli offers hot, delicious, and convenient meals like pizza, sandwiches, and hot dogs. And if you like a bit of entertainment with your food, our Player’s Bar offers a wide variety of beer, wine and cocktails, plus scrumptious appetizers and live music every Friday and Saturday night. Even if gambling isn’t your thing, Golden Acorn Casino offers 24/7 service to all travelers, from road-trippers to long-haul drivers. Our Travel Center amenities include showers, laundry facilities, a lounge, a car wash station, and a 3,000-square-foot convenience store open 24 hours a day. We also have the lowest gas prices in the area, including a selection of racing fuels if you’re heading out to the desert with your toys. On that long drive from San Diego to El Centro, you can’t miss the bright lights of Golden Acorn Casino. Whether you’re looking for a night out or a welcoming place to stop and rest for a spell, take Exit 61 (Crestwood Road) off the I-8 and join us for food, fuel and fun.